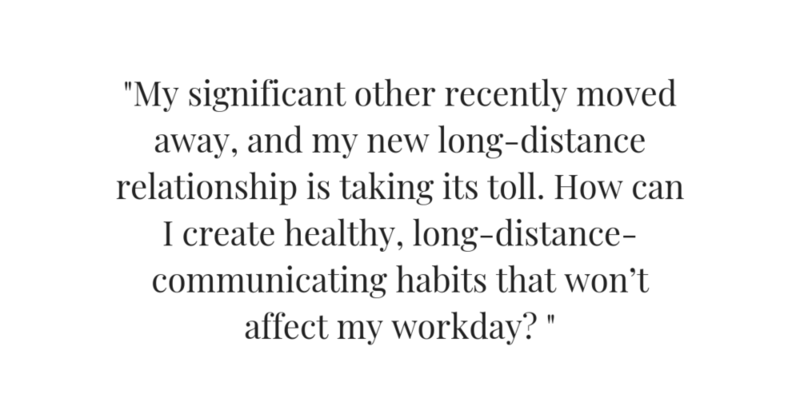 With Valentine’s Day on the mind and the agenda this week, the latest chapter of Asking For a Friend is dedicated to workplace romance: how to avoid it, test it out, and keep a LDR afloat with a busy schedule. I always come back to the same conclusion: Speak up. I know that sounds uncomfortable, or intimidating or difficult, but it really is more powerful than you think. It was a female executive from a company I worked for who first gave me this perspective—and backed me up when I spoke up to a man (five levels above me) about his inappropriate behavior for the first time. I try to approach these situations in a matter-of-fact tone, with phrases like, “I wanted to talk to you about something that made me really uncomfortable…” or, “I want to assume you had good intent, but [scenario] really made me feel uncomfortable.” Every time I’ve approached it as a conversation and learning opportunity for those involved, I’ve had great success. The behavior has always stopped, and sometimes I see it change for other people as well. As we saw with the #MeToo movement, things change when people speak up (and people can’t change what they don’t know about). Without examples it’s hard to give more specific advice, but I would just say to keep your exchanges brief and professional on your end. If they are borderline flirty, just make sure your responses remain succinct and only work-related. If he says something completely out of bounds, try to be direct and say, "I would like for our relationship to remain professional and I don't think the comment you just made fits in a professional setting." First, check your workplace’s policy on inter-office dating. Then, if it won’t risk your job, go ahead and move forward. I knew someone who flat-out said, “I think we should go on a date.” When confronted with the challenges of inter-office dating, they replied: “It’s just one date, and if it goes well we go on another. If it doesn’t, we don’t. No pressure; just a first date.” It shocked me how well that approach keeps things from being awkward. If they say no, you just say “OK,” and move on. That way there’s no lingering weirdness or discomfort between people. You could even start by saying it as a joke, and throw it into conversation randomly. If they bite, then you know. If they don’t, then default to the direct approach above. Ultimately, they won’t know how you feel unless you share—so go for it! Focus on you, girl! When I was in a long-distance relationship I took that time to work on myself. Get into a gym routine, pick up a new hobby where you might meet new friends or find a new passion. As far as day-to-day communication, what worked for my SO and I was limited conversation during the day (think, texts like “I miss you” or, “The craziest thing just happened; I can’t wait until we talk later!”) and setting up a time each night during which we talked for longer periods to fully recap our days (like you might do if you actually lived in the same city). I know exactly what you’re going through; I just moved in with my boyfriend after nearly two complete years of being long-distance. Check out my article about balancing a long-distance relationship and a career, because there are so many tips and tricks for hustlin’ babes who don’t have their loves (professional and personal) in the same city. If you want your relationship to make it, you have to make communication a priority. Try to set a FaceTime date every day (or couple of days) so you both know that’s your protected time to really see each other and talk face-to-face. And if you know there’s going to be a set time to talk, that can cut down on the frantic need to be in constant communication.